In a recent work published in The Astrophysical Journal, Dr. Zhifu Gao, an associated research fellow at XAO pulsar research group, and his co-researchers obtained new theoretical results for the magnetic field and spin-down evolutions of pulsars. PSR J1640−4631 is the first pulsar reported with high braking index of 3.15(3) measured at X-ray band and is associated with a supernova remnant. Its energy loss from rotation serves as a supply of high energy to photons, which results in a pulsar wind nebula (PWN) that is the most luminous source of TeV γ-ray in the Galaxy. In this work, the high braking index of PSR J1640-4631 was interpreted with a combination of the magneto-dipole radiation and dipole magnetic field decay. 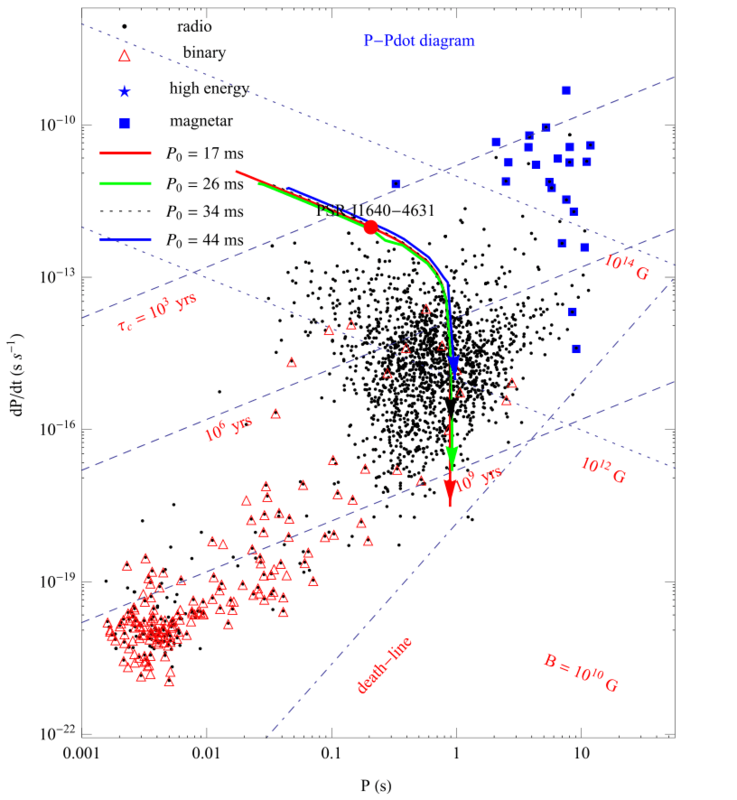 By introducing a mean rotation energy conversion coefficient, which is the ratio of the total high-energy photon energy to the total rotation energy loss, and combining a reliable nuclear equation of state obtained from the pulsar’s observations, they estimated the initial spin period, P0 ~ (17–44) ms, and the true age, t～2900-3100 yr, of the pulsar. The high braking index was attributed to its long-term dipole magnetic field decay. After 105-106 yr dipole magnetic field decay, the pulsar moves toward the bottom right region in the P-Pdot diagram and eventually reaches the death valley located on the bottom of diagram (see Figure 1 for more details). It is the first time researchers put forward a ‘Coupling model’ for neutron star’s magnetic field and rotational evolutions. In addition to explaining a pulsar’s high braking index soundly, the proposed Coupling model will find wide applications to pulsars with low braking index, such as PSR J1734-3333. The work is developed based on and inherited from the classical magnetic dipole model, and expected to attract more attention from colleagues both at home and abroad.